A lot of places have burgers on the menu, but few places have only burgers on the menu. Such is Whack Burger. The comic book-themed Covington joint opened in June and serves up burgers that would still appear large when grasped by Andre the Giant's fist. Flavors abound in the 14 burger "styles," to wit: Curry Chutney (onion chutney, curry seasoning, and shredded lettuce); Brie & Apple (grilled red apples, melted brie, and ketchup); and Mediterranean (garlic hummus, black olives, feta cheese, and sprouts). For the timid, there are a few less wacky options, such as the Classic (bacon, cheese, lettuce, tomato, and onion) or the namesake Whack Burger (bacon, jalapeno, onion, lettuce, cheese, and a secret sauce). Once you choose your style, choose from beef, turkey, or black bean patties. The carnivorous options are processed and packed by Heringer Meats, right around the corner; the black bean patty, which is more like a black bean mash, is cooked in-house with spices and veggies. You can even get the whole thing chopped up on a salad. While our favorite was the beef patty, all on-the-bun choices have two things in common: they are quite tasty, and terribly messy. The sheer size of the burgers makes them hard to handle-the toppings will spill back onto your plate, but you'll still scoop them up. All you need is a pile of napkins, a monstrous appetite, and the fortitude to keep eating when you really should stop. At the end of our meal, none of our plates were cleared, none of our faces were clean, but all appetites were sated. Pro tip: Eat at the bar in front of the mirror so you can watch yourself consume a gigantic, one-of-a-kind burger and revel in your messy face. Then wipe it off and go back to work. 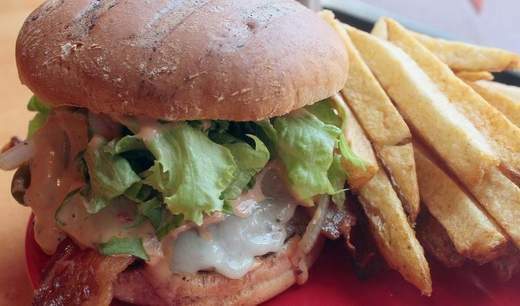 This locally owned burger shop uses a broiler to cook their burgers, and you can tell; they've got a nice char. My Kalifornia Burger was almost pink inside, and there was no actual meat juice, but it was juicy to bite into. The addition of avocado, corn salsa and sprouts was good, and burgers come in many variations, including a Jambalaya and a Brie and apple burger. On the side, I opted for a nice tangy broccoli slaw. That's different. What do ground beef, onomatopoeia and a slew of fresh ingredients have in common? 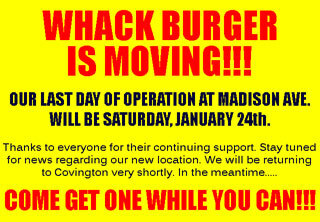 Well, nothing, really, unless you're at the new gourmet burger restaurant WhackBurger in Covington. The small restaurant has been open for about a month now, serving big, juicy burgers with creative toppings right across the street from Madison Theater. I'm a huge fan of restaurants with simple menus and a clear specialty, and WhackBurger takes the prize for both these things. They offer essentially one thing (you guessed it - burgers). There are 14 styles of burgers and six different sides. You pick one of each and pay the only price listed on the menu: $9.95. Simple, yes. But the options are anything but boring. Take, for instance, the Egg & Green Chile burger with a fried egg, melted bleu cheese and green chile relish or the Aufiderzein with grilled sauerkraut, Swiss cheese and spicy mustard. Pow! OK, so you might be wondering what's up with the name and the sound effects. Inside the small storefront restaurant, at the end of the long bar-seating on the left side, you'll find the inspiration for owner Mike Harwood's first restaurant: pages and pages from action comic books covering the back wall. The rest of the space is small but open with only a few tables, and the storefront window makes it inviting and bright. I headed down to Whack Burger on a recent Saturday night with my girlfriend and a couple friends. The size and seating options of the restaurant had us a little confused at first, being somewhere between a proper sit-down restaurant and a carry-out-only joint. But there is an obvious counter to order from before you find your seat, and they'll bring the food out to you. The menu, though simple, allows for plenty of customization. Choose from beef, turkey or black bean for your burger, white or wheat brioche bun, then toppings and lastly a side. Drink options are limited to typical fountain drinks and a few bottled beverages; no alcohol. I went with the Fried Green Tomato burger with beef on whole wheat and a side of fresh cut fries. This beast of a burger is topped with a slice of fried green tomato, pepper jack cheese, bacon, lettuce and malt vinegar mayonnaise. The beef was a thick patty cooked medium-well - just a hint of pink, but still very juicy. The toppings were piled high and the bun was sturdy enough not to turn into a mushy mess, which is quite a feat with a burger this juicy. If I could pick any restaurant-reviewing superpower, it might be the ability to fit a burger of this size into my mouth. But I did my best, nibbling through it until it was gone (I might the slowest eater in the world). This burger was very tasty, but the fried green tomato paired with the bacon and juicy beef makes it quite rich. Next time, I'll try a lighter option like the Brie & Apple burger with grilled red apples, melted brie and ketchup. The fries were huge, fresh and tasty. But perhaps due to their size, we all found them to be overly oily. My girlfriend is a vegetarian, so she went with the Black & Bleu burger with a black bean patty. The Black & Bleu has the usual blackened Cajun seasoning and bleu cheese crumbles with the addition of a spicy jalapeno hot sauce. 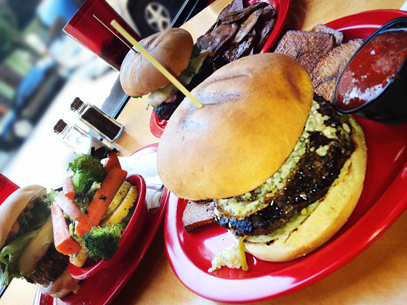 The black bean patty was thick and flavorful, and we both loved Whack Burger's spicy take on the Black & Bleu. We both also liked the broccoli slaw she chose as her side. It had lots of shredded broccoli in a thin and pretty typical cole slaw style dressing. Other sides include fresh cut chips, fruit salad and jambalaya. I should also mention the turkey burger option, which our friends got on the Kalifornia burger they shared. The turkey was cooked through while still being a juicy tasty substitute for beef. They enjoyed the combination of avocado, sprouts, cheddar and salsa on the Kalifornia. Overall, we all enjoyed our food and the experience. The only beef I have with Whack Burger is the lack of seating for larger parties. But with all the delicious options at a great price, I'm sure that won't deter plenty of neighborhood regulars and concert-goers from coming back again and again. One caveat: You better go hungry. You're not going to want to leave anything on your plate. Covington's new gourmet burger joint wants to sucker punch you with their array of burger styles and graphic novel motifs. Located in the Wedding District across the street from Madison Theater, this hip eatery deserves a visit whether or not it's a show night. 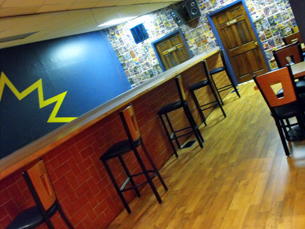 The mood: Keeping with the comic book theme, blue, yellow, and red graced three walls with a yellow lightning bolt cutting down the middle of the azure wall. One wall was plastered with comic panels featuring sounds like "choom croom doom" and "wham." For dining in, there's four tables and a long counter facing a mirrored wall plus two outdoor tables. The food: It's counter service here so we perused the menu featuring 14 different styles of burgers. Here's how it works: Pick a protein patty: beef, turkey, or black bean, then choose a white or wheat brioche bun or get it bunless as a salad. The multitude of burger options seriously stumped me. They have a Kalifornia (avocado, black bean and corn salsa, garlic yogurt spread), egg and green chile, curry chutney, an Italian with pizza sauce and Aufiderzein (grilled sauerkraut, swiss, spicy mustard), and really, you can't go wrong with any combination. Adam immediately ordered the Supercuban on Wheat (beef patty, smoked ham, provolone, swiss, and spicy mustard). For $9.95, you get one side, so Adam chose their Jambalaya. A few minutes later, our food arrived piping hot. Adam's burger was piled high and my salad was layered with spring lettuce, the burger, the fried green tomatoes and smothered in cheesy goodness. I liked how all of my condiments came in separate cups and that the burger was soft, an indicator of that hand crafted freshness. The verdict: I really liked how they happily catered to both vegetarians and carnivores with their build-your-own-burger concept, which made me want to try the rest of their styles.